Are Offered When The New Itineraries Come Out! and Cabins are Going Fast! While there is a perfect cruise vacation for everyone, not every cruise line is the ideal match for every family. Some lines have minimum age requirements for children (and pregnancy policies for expectant parents! ), and others don't permit children to sail at all. In addition, while a line may allow children to sail, it’s not a given that the line has specially designed children’s programs in place. With these things in mind, determining the best cruise line for your family takes careful research, preparation and planning. The travel experts at CruiseCompete have composed the “2016 Family-Friendly Cruise Travel Planner,” which details every aspect of the family cruise vacation experience. 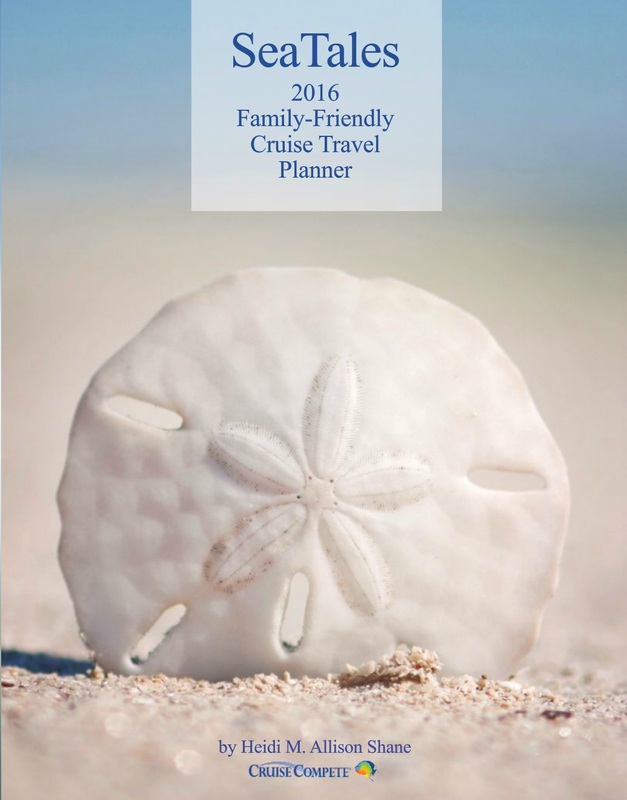 The “2016 Family-Friendly Cruise Travel Planner” is designed to kick-start your cruise vacation planning, and covers the entire spectrum of options with information on mainstream lines like Disney Cruise Line, Royal Caribbean International, Carnival Cruise Line and Norwegian Cruise Line, as well as unique alternatives like luxury, river and small ship excursion companies. All information has been compiled in an easy-to-read format, with brief “at-a-glance” summaries to see if the cruise line fits your basic requirements, followed by more detailed information about the atmosphere on board, the destinations you can travel to and the specific programs available for children. Baby-Friendly Cruising - Take a Nanny or Use Onboard Babysitters or Kids' Programs? Tips for Parents Cruising with Teens and Tweens -- Will your tweens and teenagers have fun? Family Reunions With A Splash - Is a Cruise Right for your Family? Cruises are a Great to Travel for Families Celebrating Holidays, Graduations or other milestones or just make it a Family Reunion. 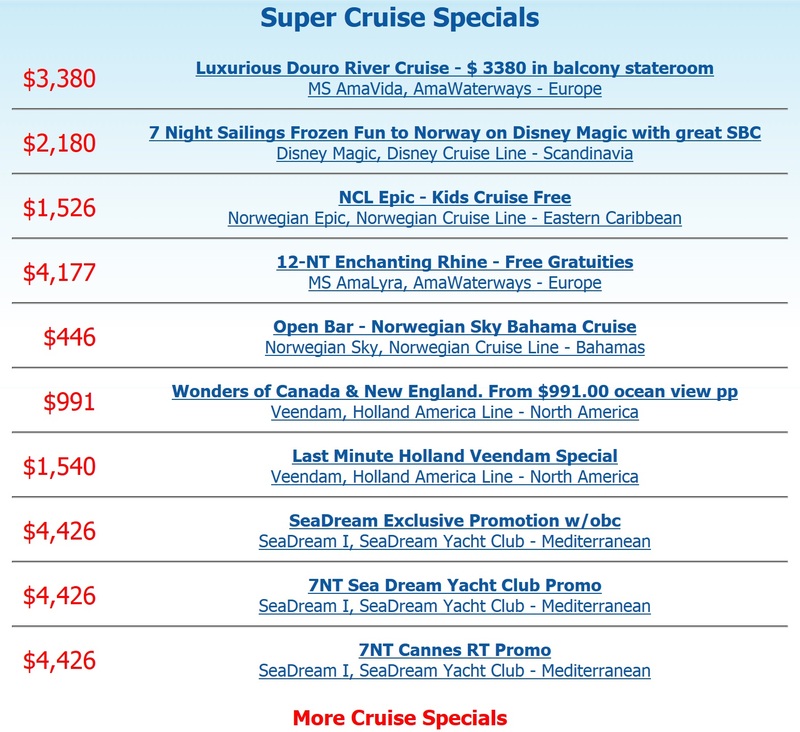 The greatest deals are offered when the new itineraries come out. The lines want to have commitments early, thus offering special fares and amenities for early bookers. Some of the lines, particularly the ultra-luxury, have 2017 and 2018 itineraries out and are taking bookings now for those forward years. Celebrity Cruises just released 2018 itineraries and is taking bookings. Search itinearies by destination, sail date, or cruise line here. Alaska is this years hottest destination, and cabins are filling very quickly. Don't miss out on your chance to experience the glorious wilderness of ice-blue glaciers, snow-capped mountain peaks and huge whales breaking the surface of pristine waters. Alaska is a rugged, untamed wilderness where the forests go on forever...and summer days never end. Search Alaska Cruises here. Start Planning Your Cruise Now! A tutorial on getting started.